Last year BridgeEnglish, Denver moved from the location we held for over 20 years to our brand new location in downtown Denver. The new center is conveniently located within walking distance to many of downtown’s attractions, including the 16th Street Mall, the Colorado State Capitol Building, Union Station, and the Denver Art Museum. In addition to the excellent location, the center offers cutting edge technology, comfortable classrooms, a student lounge, and many other amenities. 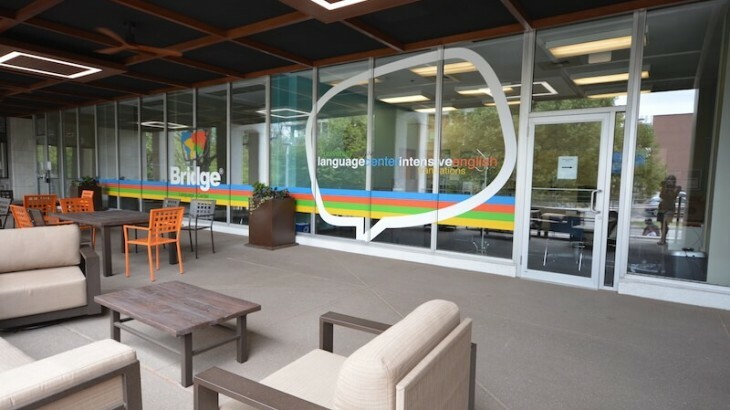 We invite you to take a photo tour to get a glimpse of what you can look forward to when you study English at BridgeEnglish, Denver! Our center is located in a building on bustling 16th avenue. Just two blocks away is a major transportation hub, Civic Center Station. The station serves over 20 public transit lines, including two free downtown services, making it easy to get to the center from anywhere in the city. If you want to ride a bike to class, you can park your bike at the free, secure bike racks outside the building. Before you head to class, stop by the cozy coffee shop on the ground floor of the building—treat yourself to a gourmet beverage and pastry to jumpstart your morning. Or, stop by between classes for an afternoon pick me up! You’ll feel right at home as soon as you step inside our welcoming lobby. If you have any questions or need assistance, our friendly and supportive staff and teachers are always available to help. Looking for information on upcoming events and activities? This is the place to go! If you have a few minutes between classes, the lobby is a great place to spend time catching up with friends…or taking advantage of the center’s free wi-fi! A popular place to hang out between classes, the spacious student lounge is perfect for studying or socializing. You can also take advantage of our computer lab, offering several Macs with broadband Internet connection. Our 11 climate-controlled classrooms feature modern technology, including digital displays. Several private classrooms are available for private English lessons. Our group classrooms are the perfect size, enabling you to truly get to know your classmates and teachers and receive all the help you need. Floor length windows offer natural lighting and a great view of tree-lined 16th street. If you’re looking for a place to store a snack or grab a much-needed cup of coffee, head to the kitchen! A coffee machine, refrigerator, sink and more are all available for your use. Our patio provides a comfortable outdoor eating area. Step outside and enjoy your lunch, get some fresh air, and watch the world go by! Visas 101: Bridge Experts Answer Your Questions! Five Things International Students Can ONLY Do in Denver!